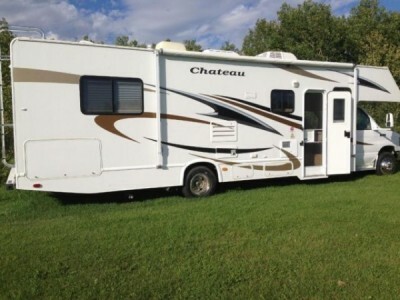 2010 Citation Chateau 31Ft Class-C Motorhome. only 2211 miles, Slide (booth & H/Bed); Rear queen island bedroom; Back up monitor; 4.0 Onan Generator; Center kitchen; Walk through 3 pc bathroom; 26" LCD TV on elec swivel; Awning; Ford E450 Chassis; Ford V10 Gas motor; Air/Tilt/Cruise; Power windows & locks. Excellent Condition. For more information call: 306-231-7677. 2001 Thor Mirage 2800RK 5th Wheel, 2 Slide Outs, Hydraulic Jacks With Rear Stabilizers, Hard-Wall Construction With Gel-Coat Finish, Aluminum 16" Rims, Two 30lb Propane Tanks, Awning, Outside Shower, Pass Through Storage, Dark Thermo Windows With Day Night Shades, Queen Bed, Mirrored Wardrobe - Oak Dresser And TV Entertainment Center, Tub/Shower With Glass Enclosure, Skylights And Humidity Fans In Bathroom And Kitchen, Hideabed Couch, Fold - Down Table, Oak Cabinets, Solid Surface Counters, Entertainment Center With TV, Radio, Cassette & CD Player Complete With Internal/External Speakers, Ducted Heat And AC, Fridge, Stove With Oven And Microwave. This Unit Sleeps 6 Occupants Comfortably. Please call 403-854-1946. 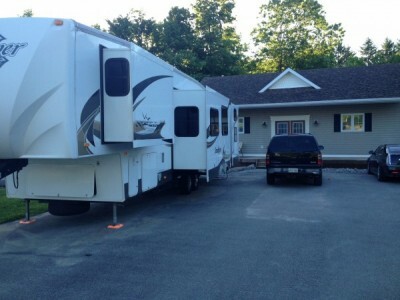 2009 K-Z Inferno 29FSL Toy Hauler, 33ft, Great For Those Who Love To Four Wheel. Comforts Include....Onan Gas Generator, 1 Ducted Roof A/C, Double Door Refrigerator, Main Awning, CD Radio, Outside Stereo, TV, DVD Player, Exterior Shower, Sleep 10, Convection Microwave and 3 Burner Range. Explore Texas In This Beauty! Please call 780-603-8544. 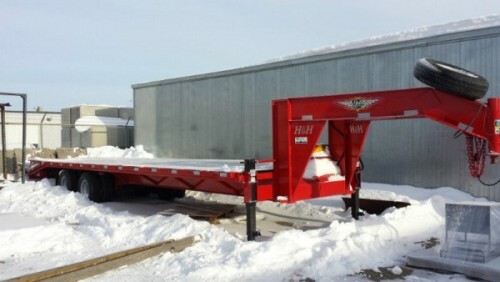 2013 H&H Gooseneck Fifth Wheel. H & H Signal Red - 25' GN Flatdeck plus 5' levelling dovetail, Dually 12000 lb. axles plus rub rail, Sliding winch track and 5 winches, 4" winch track, Spare tire & mount, King Pin and chain box, Under deck tool box, 9 tires includes spare. like new. purchased in January 2013 and never used. Please call 780-413-7578. 2014 Crossroads Zinger 33BH, Crossroads has stunning decor with glazed cocoa cherry cabinetry enhanced with decorative glass inserts, radius corner walls are accented with bruch nickel decorative lighting and wall paper border. 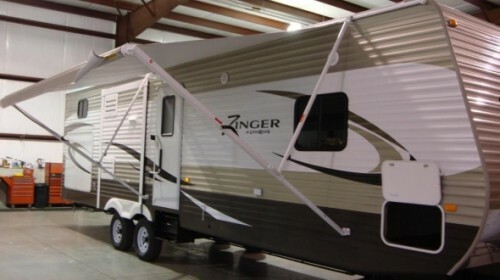 Zinger offers alot of features that make the camping experience feel like the comforts of home. Exterior kitchen / shower, sleeps 10, A/C unit, Bunk model, 3 slides. CONVENIENCE PACKAGE STANDARDS: 3-BURNER RANGE WITH OVEN, TV ANTENNA, TUB SURROUND, SMOKE DETECTOR, LP DETECTOR, 13,500 BTU AIR CONDITIONER, AWNING, MICROWAVE, DRAWERS UNDER BOOTH DINETTE, POWER VENT IN BATH, SWING-OUT ASSIST RAIL, 6 GALLON DSI GAS ELECTRIC WATER HEATER, NIGHT SHADES, STABILIZER JACKS, SINK COVERS. OPTIONS ON THIS CAMPER: ZINGER CONVENIENCE PACK, RANGE BI-FOLD COVER, SKYLIGHT IN KITCHEN/LIVING ROOM, SPARE TIRE & CARRIER, RVIA SEAL, COACH-NET ROADSIDE ASSISTANCE. Please call 705-272-9167. Ceiling Fans, Rear Cameras, Security Safe, Keyless Entry, Ceramic Tile Floor. Please call 780-835-0102 if interested. 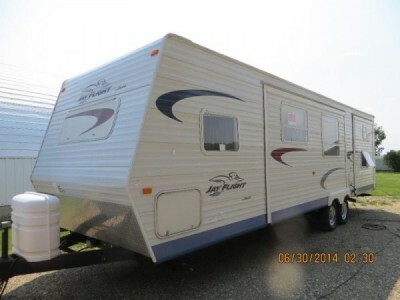 2014 Forest River Salem 312QBUD Hemispere Trailer. Used for 12 nights. Outside kitchen, power awning with LED light,power jacks, power slides all on remote. Corian counter tops, built in vacuum, oversize fridge, Glass top stove, to much to list. Comes with flat screen TV, propane tanks, and battery. Please call 403-461-1544. 2008 Forest River Lexington 255CD Class-C Motothome. Excellent condition. 26 feet. V10 Motor, New Awning and all new tires in 2014. Air conditioning, microwave, pull-out pantry in kitchen area, toilet and shower is separate from vanity, great storage in bedroom with queen island bed and built -TV. Bucket seats in cab, back-up camera, and up-graded radio with blue-tooth. Entertainment centre and cabinets above cab. 3 storage compartments outside. Has awnings over slides. Stored in heated shop. Please call 780-621-9152. 2004 Keystone Laredo 27RK Fifth Wheel. White ext, This 2004 Keystone Laredo 27RK is in excellent condition. It is 27 foot long and has a super slider to expand the kitchen/living room area. The rear kitchen is set-up with a 3-burner stove, refrigerator and freezer, microwave oven, and plenty of oak storage cabinets. It sleeps 4 with a Queen-sized bed in the front bedroom area, kitchen has a real table and chairs rather than a fold down bed. It has a swivel sofa chair, sleeper sofa, and a built-in television/electronics cabinet. The Camper includes a hallway bathroom with shower, a ducted A/C system, and it has a fiberglass exterior with aluminum frame on dual axles. It also includes powered front jacks, a rear ladder, an exterior shower, pass-through storage underneath in the front, dual propane tanks in their own cabinets on each side in the front, and an awning. The 5th Wheel has been adapted for a "Gooseneck" attachment. The tires are brand new. 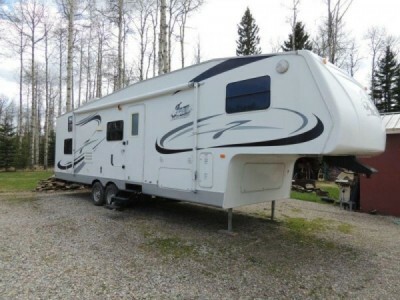 This camper has been barely used and the interior shows the lack of wear and tear. Please call 780-220-0824. 1970 MCI Conversion Bus, motorhome everything is here to convert to motor home bathroom facilities all kitchen appliances fridge stove hot water tanks electric and propane grey , black and fresh water tanks queensize bed in back hideabed in front microwave, converter, inverter. Please call 250-618-6502. 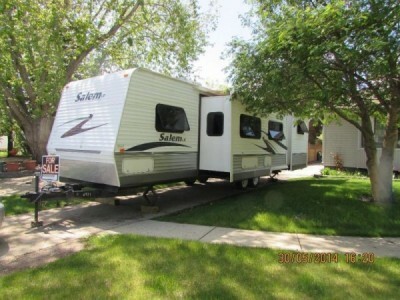 2007 Keystone Cougar Trailer. 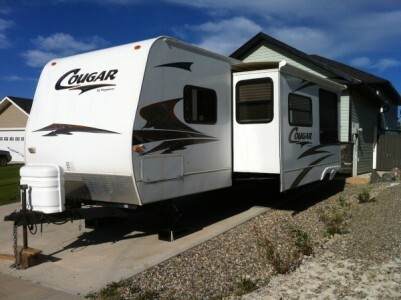 30ft cougar holiday trailer, winter package, new tires, new batteries, sleeps 8, awesome trailer. 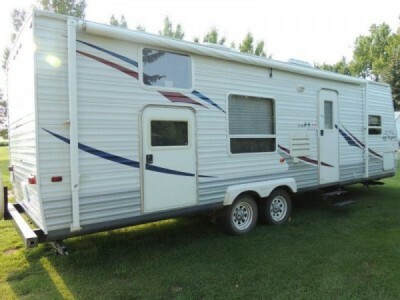 Comes fully equipped w dishes, bedding, towels, flat screen and everything they will need to hook up and go camping. Do not want to get rid of it but I'm getting rid of the truck and my other vehicle will not pull it. Please call 250-793-5747. 2005 Thor Jazz 30Ft Fifthwheel. Excellent condition, barely used, smoke free, a must see. 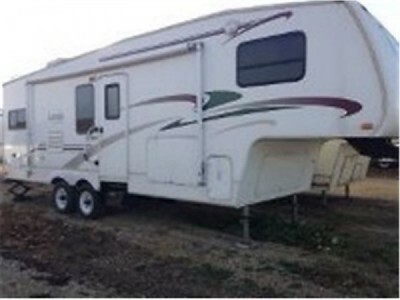 Has 2 slides, sleeps 6, queen bed, entertainment center/tv, full bath/shower, large kitchen area/counter space, microwave, day/night shades, large closet space, significant storage, reclining area with 2 recliners. GVWR 11,000 lbs. Please call 780-686-4552. 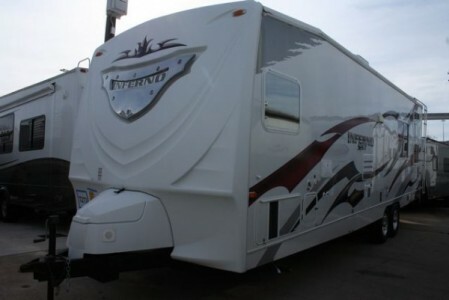 2010 Forestriver Sandpiper 355 QBQ Fifthwheel. 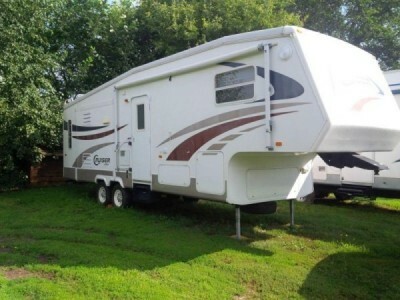 Beautiful family trailer with 2 baths and separate bunk room. Trailer has room to sleep 12 comfortably. 2 sets of bunks with a trundle bed under each. King sized bed in the master. Hock up for washer and dryer. Air conditioner with ability to add a second. Ducted furnace. Outside fridge, electric awning. Please call 705-305-9469. 2007 Adventurer 89WS Camper. We are parting with this great unit that we adore for health reasons. We are the first owners, also just installed a 7ft awning in the back and only unrolled it once. Sleeps up to 5 with a full winter package and the interior is in excellent condition. Comes with new batteries and 2new propane tanks. 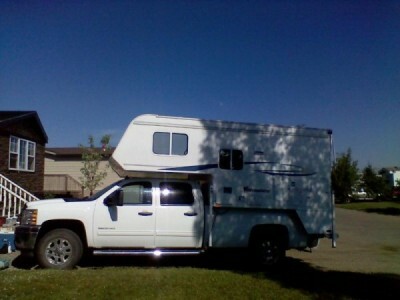 It is being used with a 3500 chev (not a dually) that is also available if interested as one unit. We will entertain trades if you have something of similar value. Please call 780-215-4121. 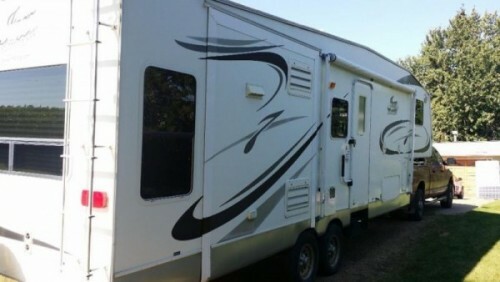 2006 Glendale Titanium 34Ft Fifthwheel trailer for sale. Excellent shape and loaded with lots of features. Trailer is in excellent shape and has been very well cared for and would be great for short weekend trips or month long stays. Tons of space and all the features of a home or cottage to take with you on the road. 3 Slide outs, 2 motorized for main living area \ kitchen and 1 manual for bedroom closed, Full bathroom including full sized shower and separate vanity and separate enclosed toilet. Bedroom area is over the hitch and can be closed from main living area, 6 ½ foot ceiling with queen bed, cabinets all around bed and storage under bed (bed lifts for access), Galley style kitchen with hard surface counter top, mid-sized sink, combination auto switching propane\electric refrigerator with freezer, stove top and oven, Full sized kitchen table seats 4 with standard chairs, Large living area with lots of extra storage and ventilation including overhead ceiling fan and powered roof vents, TV with wiring for either satellite in from external or onboard antenna, Propane fireplace in living area that provides heat, Pull out couch in living area and expands to double bed, Rough in for washer and drier, Central furnace and air conditioner with internal thermostat control, Central Vacuum System, Double awning on outside provides full side coverage for excellent shaded sitting area, Large storage compartment at front including separate storage for waste hose, External hookups for high pressure water at site, Filtered water system installed for kitchen sink and on board water heater connected to entire water system. Exterior Shower, Brand New Premium Storage Cover and Wheel Covers. Trailer is located near Orillia and showings can be scheduled on weekend. Please call 705-826-1896. 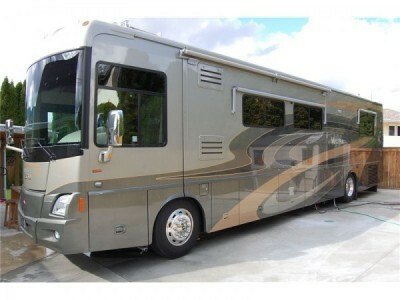 2007 Gulfstream Ultra 32ft Class-C Motorhome. Comes with generator. Please call 905-895-1954 for more info. 2004 Forest River Surveyor Fifthwheel. 18 ft Bumper pull travel trailer. Has dual axels, sway control hitch. 3860 pounds. This trailer is clean and has bin well taken care of. Everything works perfectly. The trailer has dual propane tanks. In the trailer there is stove, oven, microwave fridge/ freezer and side by side sinks. this trailer has a cd/ cassette / aux in audio player. Please call 403.358-6573. 2008 Starcraft Travel Star XL28550 Trailer. well maintained and in great condition, 2 slide outs offering a lot of interior space, queen suite, kids bunk beds, plus extra beds, full bath with tub, shower, etc, plenty of storage, large awning over doorway, AC and central heat, complete with pots, pans, dishes and silverware ready for camping! A must see! Please call 780-788-5044 for further details. 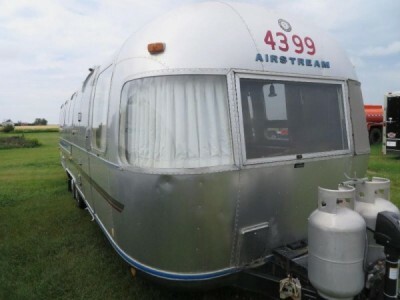 1983 Airstream Soverign 31Ft Trailer. 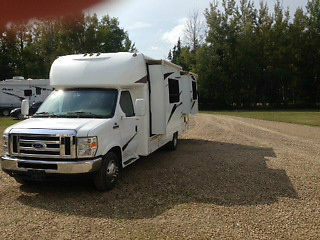 Just completed inspection by High River Autoplex & RV. Everything in good working order. Please call 403-616-1776. 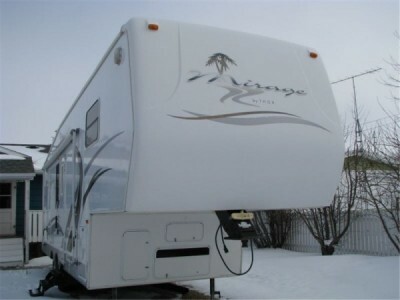 2006 Triple-E Topaz F253SE 27ft Fifthwheel. 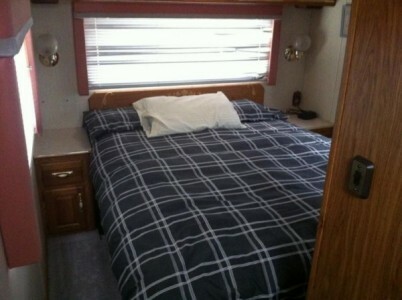 Great, very clean, nicely decored, with Jack & Jill bunks in the rear and full queen bed up front and one slide out. 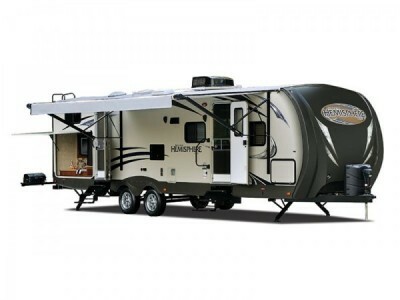 Includes roof top air, ducted heat, wired for 135W portable solar panel, Morningstar TriStar TS-45 solar controller, fantastic fan over main bedroom, TriMetric 2025 RV battery monitor, Tornado black tank flush, LED lights in bathroom, day/night shade and dual Trojan T105 6V batteries. Wonderful condition! Please call 403-829-7746. 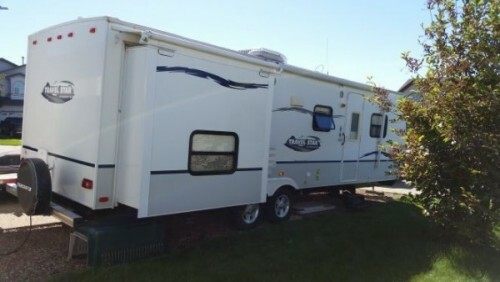 2007 Jayco Jayflight 29BHS Travel Trailer. Fully Loaded, Excellent Condition - very little use last 2 years. To view, please call 780-264-8435 and leave message. 2006 Forest River Salem 30BHBS Trailer. Good condition with 2 slide outs, living and dining area and the 2nd bedroom. Queen island walk around bedroom. Sleeps 8 and plenty of storage. Ac/furnace, stereo/CD with inside outside speakers, 2 door fridge, propane stove and oven, pantry and large 3 door closet, stabilizing hitch and more. Please call 780-640-2732. 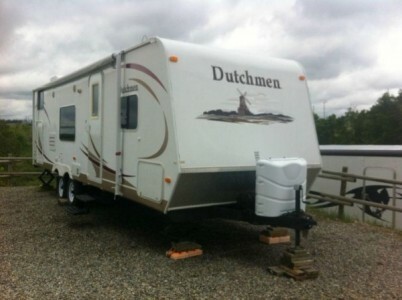 2010 Dutchmen 28G-GS Trailer. Lite Fibreglass Hard Wall. 2ft slide. Queen bed with solid sliding privacy doors. Air conditioning. Sleeps 8. Fold out sofa bed. Kitchen table converts into bed. Jack and Jill bunks. Outdoor shower. Sto n Go storage. Under master bed storage. Pass through storage at front Axles flipped for more clearance. 2 6volt deep cycle batteries on customized tray. 2 30lb propane tanks. Excellent condition serviced and winterized in early fall. Not used very often as wife does not really like camping. Located North of Calgary between Crossfield and Carstairs. Fridge works on electric, but needs a flame sensor installed to run on propane. The price is FIRM. Please call 403-650-3716. 2006 Crossroads Cruiser 28RL Fifthwheel. Great unit, lots of storage, A/C, 2 batteries, 2 - 30lb. 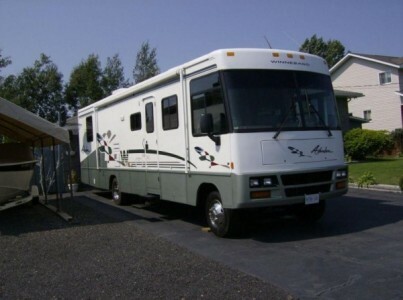 propane tanks, 2 slides, power front stabilizers, awning, oversize fridge, private bedroom with queen bed. Stereo system with CD player, TV , cable/satellite hook up, 2 swivel chairs, sofa bed and more. Please call 780-908-6095. 2006 Thor Jazz 2980BH Fifthwheel. very clean and in great condition! 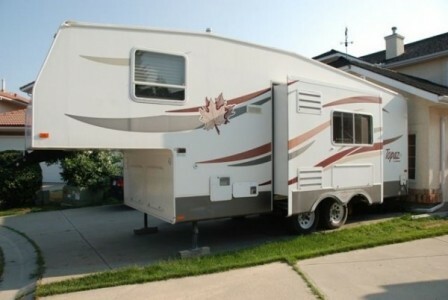 The trailer features a large 12ft slide, rear bunk beds in a self-contained room, sofa with pull-out bed, dining table that converts to a double bed, loads of storage space and cupboard space, full double sink, large Norco fridge, stove (with larger oven), hood fan, microwave, furnace, air conditioning, full bathroom with tub/shower, 27 inch TV with DVD player, amazing stereo system with surround sound, awning and lots of sleeping room. This unit is extremely clean and well taken care of with all the comforts of home. It is a must see! Call Jim at (403) 638-4711 or on cell (403) 638-1484. 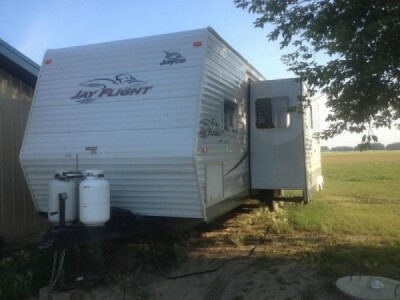 2005 Jayco Jayflight Trailer. 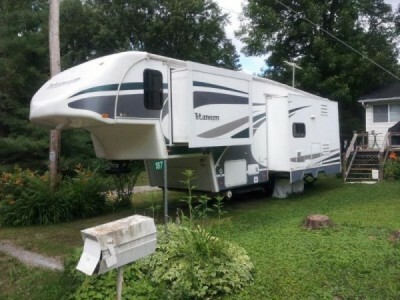 31 ft. Jay Flight bumper pull, 2 slides 3 ft. wide, rear bunks and very large living room, large awning never been used, air conditioner, tires are brand new. This unit is in excellent condition because it has been parked on a sight for whole life. Lots of storage. Sleeps 8 with 2 queen beds. Call 403-560-3528 if you have any questions. 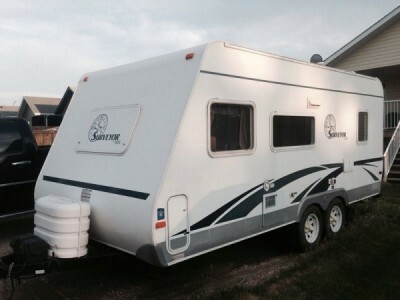 2007 Jayco Jay Flight 30JTX Travel Trailer, one owner, sleeps 10, table and couch on slide out, quad bunks. Please call 780-841-7737. 1992 Citation Excella 36SA Class-A Motorhome. Sleeps 5-6, 6500 generator on-board, Dual roof air, dash air, Fantastic fan with rain sensor, oven 4 burner stove, microwave, rear bedroom walk-around queen, Large bathroom with corner shower, ower jacks, sat dish and receiver, TV / DVD combo, 20 foot awning, 454 gas engine (10 mpg highway), convertible couch, 1 year old water heater with dsi, central vac. Ready to go. Please call 780-621-9126. 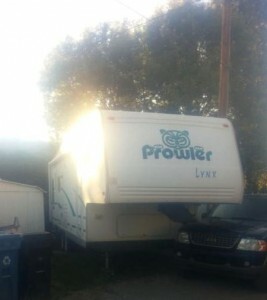 2003 Fleetwood Prowler 28Ft Fifthwheel. Ultra lite frame, weighs in at 7200lbs. Lots of storage. Memory foam queen size mattress in main bedroom, One pop out. Sleeps 6 comfortably. A must see. Asking $14999.00 or best offer. Must sell! Please call 403-827-1926. 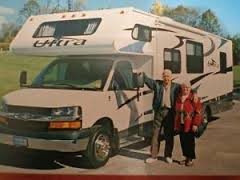 2000 Winnebago Adventurer 36Ft Class-A Motorhome. This coach is in mint condition… I know all of the ads say that, then you go to look at it and you are disappointed. If you come to see this coach and it is not what I say I will pay your gas! It is in fantastic & clean condition and requires very little to make it as good as the day it was built. It is a non-smoking coach. It only has 96,000 original klm or less than 60,000 miles, on a excellent Ford V 10 Triton gas engine ( barely broken in ) new tune up, oil change, lube, and alignment etc....( fully service and ready to go for a long trip). I have all manuals and work service order to go with this units. 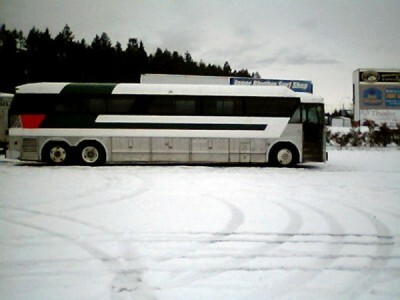 New this coach was sold for $140,000.00 plus tax,s. Now its a price of a good car, think about that! Call today 705-969-9110.